Jakarta, April 17 (PTI/AP): Indonesian President Joko Widodo has won a second five-year term, preliminary election results showed on Wednesday, in a victory for moderation over the nationalistic rhetoric of his rival, Prabowo Subianto. The so-called “quick counts” from reputable survey organisations that use a sample of polling stations have been reliable in past elections. 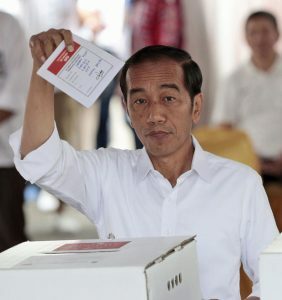 With an average of 80 per cent of sample polling stations counted, the five survey organisations showed Widodo winning 54-56 per cent of the vote, a modest improvement on his 2014 showing. Indonesia, the world’s most populous Muslim-majority nation, is an outpost of democracy in a Southeast Asian neighbourhood of authoritarian governments and is forecast to be among the world’s biggest economies by 2030. A second term for Widodo, the first Indonesian president from outside the Jakarta elite, could further cement the country’s two decades of democratization. Pre-election polls consistently gave a lead of as much as 20 percentage points to Widodo, widely known by the nickname “Jokowi.” “I’ve voted for Jokowi because five years in office was not enough for him to complete his brilliant programs for infrastructure, health and education,” said Eko Cahya Pratama, 43, after voting in Tangerang on the outskirts of Jakarta. The U.N.’s Food and Agriculture Organization and other international agencies said earlier this month that the percentage of Indonesian children suffering from stunting malnutrition that can result in lifelong physical and cognitive impairment fell to 30.8 per cent from nearly 38 per cent between 2013 and 2018.